Hi all, hope everyone's having a great winter thus far! Three chunks of news for you all today. I have three shows coming up in the next couple weeks... all in San Francisco, so if you're in the area it'd be great to see you! 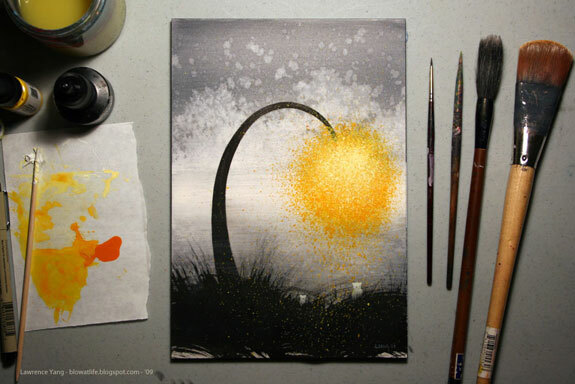 "Seussian Yellow" - One of the new pieces I'll be showing at "Paper Pushers" next week. Friday, December 4th - "For the City" at Lower Haters. Annual holiday sale, tons of great artists will be showing their work. See show details here. Saturday, December 5th - "Printed Matter 7" at Giant Robot SF. I'll be selling my brand new limited edition prints here! See show details here. Friday, December 11th - "Paper Pushers" at Gallery 1988 SF. This will be my last biggish show of the year, I'll be showing ten new pieces. See show details here. I'll be sending out a reminder email closer to the show with a preview of my work. 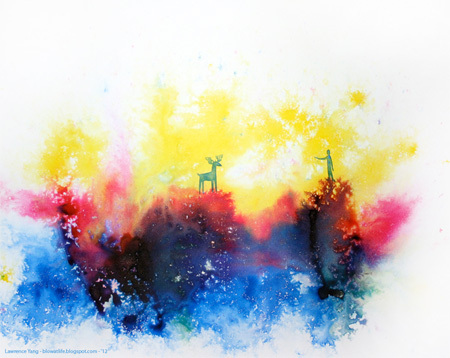 My last run of limited edition prints were of "The Chase." That run is officially sold out and closed, but never fear... You may remember that I asked you to take part in a poll a while back. 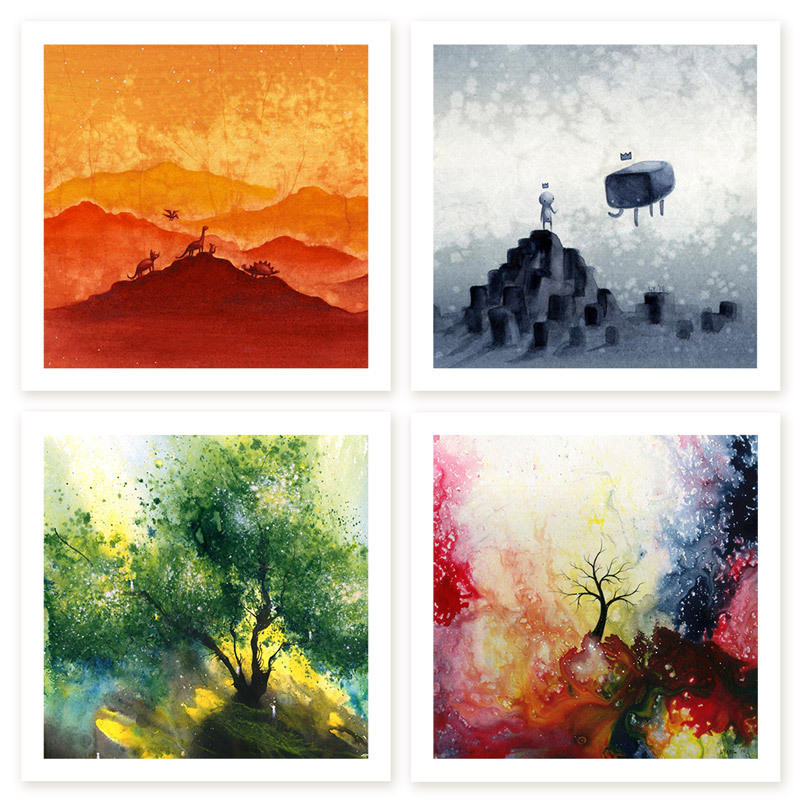 Well, I've taken in the results, and am happy to announce that I have three new limited edition prints available! 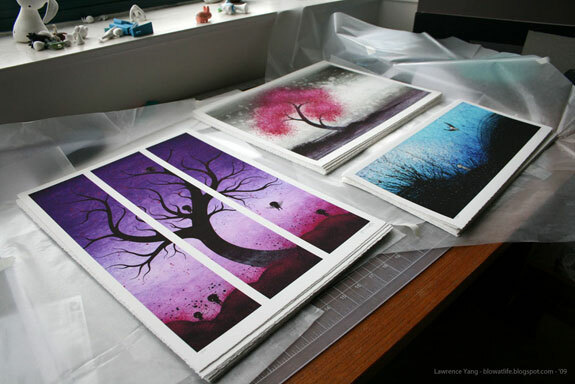 Introducing three new limited edition prints - "Bloom", "Raspberry Triptych", and "Blue Meeting". There will be one hundred of each made. 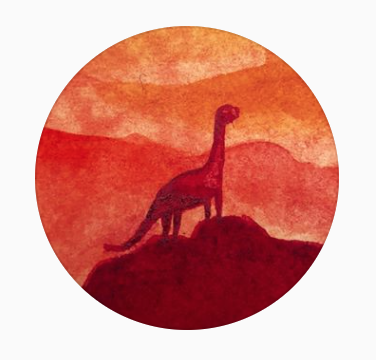 My favorite print shop SF Electric Works really outdid themselves this time - the colors are incredibly vibrant, and the archival watercolor paper feels and looks wonderful. These prints are available for sale immediately! "Bloom" for $80, "Raspberry Triptych" for $80, and "Blue Meeting" for $60. Prices do not include shipping and handling ($15 in US, more if elsewhere). If interested, please email me with the name of the print you'd like to purchase in the subject line. See more details here. 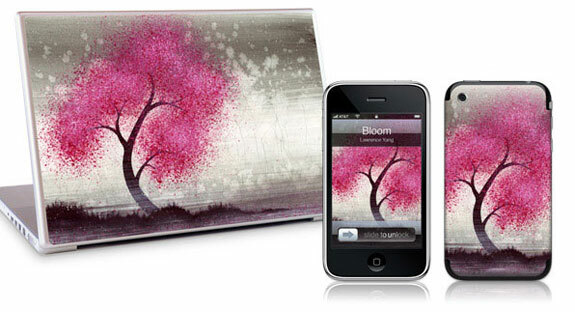 The last piece of news is that Gelaskins has just added my "Bloom" piece to their catalog of featured artist skins. This is my fourth piece with them, and I'm pretty excited to see how it will do. Take a look - you can have this artwork (as well as the artwork of many, many talented artists) on your phone, iPod, laptop, gaming device, even a Rock Band guitar! And that's about it folks. Thanks for bearing with me, and I hope you all have a great day! What kind of material is the skin thingy? I mean is it something you can add to your laptop/phone...etc or something that you buy it with? Im definitely checking back for more! I just found out about you through getting a Gelaskin of your "Growth" piece for my birthday. I don't think my Macbook could look any more amazing! Thank you for making such beautiful art.